Why Trump’s no-show at the East Asia Summit is a massive own goal. Back in November 2011, former U.S. President Barack Obama travelled to Bali in Indonesia and became the first U.S. leader to take part in an Association of Southeast Asian Nations-hosted East Asia Summit. At the time, observers in the region welcomed the move, which roughly coincided with the start of the administration’s thinking which stressed that Asia’s role in U.S. foreign policy was central in the 21st century. The Obama administration used the summit as one of the launch pads for its “pivot” to Asia strategy. Obama attended every East Asia Summit in the following years of his administration, bar one, adding high-level heft to the U.S. insistence that Asia mattered to the United States and that the U.S. would matter to Asia in the 21st century – even as a rising China loomed large on the horizon. The one year Obama was unable to attend the East Asia Summit – in Brunei in 2013 – Chinese President Xi Jinping stole the spotlight. Amid domestic political dysfunction leading to a government shutdown, Obama had to dispatch his secretary of state to the summit, unable to attend himself. That year’s event came weeks after Xi announced in Kazakhstan the creation of the New Silk Road economic belt and the Maritime Silk Road while in Indonesia. “Belt and Road’ initiatives are now the crown jewels of Chinese foreign policy, officially part of China’s constitution after the Communist Party congress last month. Xi also took the limelight at an Asia-Pacific Economic Cooperation forum in 2013 while Obama remained in Washington, dealing with a recalcitrant opposition in Congress. “China cannot develop in isolation of the Asia-Pacific, and the Asia-Pacific cannot prosper without China,” Xi said – words that now sound particularly prescient. Fast-forwarding to 2017 and U.S. President Donald Trump’s upcoming trip to Asia, it should no longer be controversial to think that simply by showing up at forums such as the East Asia Summit, the United States can make its case at the highest levels as to why the rules-based order it professes to cherish matters. Unfortunately, however, Trump will be leaving the Philippines, this year’s host of the East Asia Summit, without attending the event. While his trip to Asia will be the longest by a U.S. president in more than two decades, according to the White House, leaving the region without showing up at the summit is an unnecessary concession of the limelight to China at a time when Xi is more ambitious and clear headed about the direction of Chinese foreign policy than ever before. After months of appearing singularly focused on the North Korean crisis and trade, the Trump administration seems to be gathering around the phrase “free and open Indo-Pacific” to describe something akin to a vision for Asia. Certainly, U.S. Secretary of State Rex Tillerson and Secretary of Defense Jim Mattis have been using the phrase, but without presidential thrust behind these words, allies, partners and adversaries alike will have little reason to believe that “free and open” can trump “America First” in Asia for this administration. Trump will, reportedly, deliver a major address around the theme of a “free and open Indo-Pacific” while in Vietnam for this year’s Apec meeting. He will do so from Da Nang, speaking at the Apec CEO Summit. According to the White House’ statement on Trump’s Asia itinerary, the speech will “present the United States’ vision for a free and open Indo-Pacific region and underscore the important role the region plays in advancing America’s economic prosperity”. The content of that speech remains unknown and perhaps it is fitting that Trump, of all U.S. presidents, delivers his vision for a “free and open” Asia to a group of business leaders. 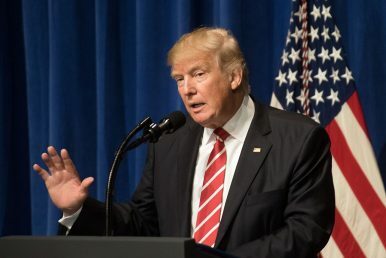 Still, nine months after Obama’s “pivot” was snuffed out with the United States’ unilateral withdrawal from the Trans-Pacific Partnership trade pact, it is somewhat encouraging to supporters of U.S. leadership in Asia to see a clear theme for American engagement with the region under this administration. For Xi and China, however, another presidential absence at the East Asia Summit will be a welcome opportunity to seize the moment to make clear that Asia’s centre of gravity is inexorably tilting toward Beijing. In two major addresses this year – his speech at Davos and his more-than-three-hour long work report at the 19th party congress – Xi has been clear about how China will handle its regional diplomacy in this “new era”. Meanwhile, an often underappreciated point in Washington is that within each Asian state, even those allied and partnered with the United States, there are proponents of closer ties with China. For these observers, the bet is clear: the United States is in irreversible decline as a regional and global power and accepting China’s open hand is the way forward. Using the East Asia Summit to make a forcing presidential sales pitch for continued U.S. involvement in Asia would have been a no-brainer, but Trump’s absence will only reinforce the narrative of a United States adrift in Asia. And with critical high-level diplomatic and ambassadorial appointments still vacant more than nine months into this presidency, perhaps that is not so far off from the truth. A version of this article first appeared at the South China Morning Post. It is republished here with permission.